If there's any solace to be taken from the Yankees' season-ending 6-1 loss in Game Six of the ALCS tonight, it's that Joe Girardi will not have the opportunity to call for a single intentional walk all off-season. Perhaps that's an unfair statement: Neither of Girardi's two major intentional walks this ALCS -- putting David Murphy on for Bengie Molina in the sixth inning of Game Four, and putting Josh Hamilton on for Vladimir Guerrero in the fifth inning of Game Six tonight -- was entirely indefensible, but boy, did they both ever turn out bad. (For good measure, Girardi intentionally walked two more guys in the seventh inning. It is possible his CAPS LOCK was stuck.) Now the season is over. It deserves to be. Girardi, who, seriously, intentionally walked four guys tonight, has had a rather wretched series, and if this week proved anything, it's that being manager of the Yankees is a job that's apparently much harder than it would seem to be. (Even the binder isn't much help!) But however shaky some of Girardi's decisions might have been, the players lost this series, all by themselves, and rather convincingly. Much has already been said about the Yankees' pitching issues all series -- they had a 5.12 ERA for the series, the second-worst ALCS ERA ever for the Yankees (behind 2004's 5.17) -- but the Yankees' hitters were actually worse. The Yankees' batting average for the series? .204 They were outscored 38-19. Alex Rodriguez was 4-for-21. Derek Jeter was 6-for-26. Mark Teixeira was 0-for-14. Brett Gardner was 3-for-17. Nick Swisher was 2-for-22. 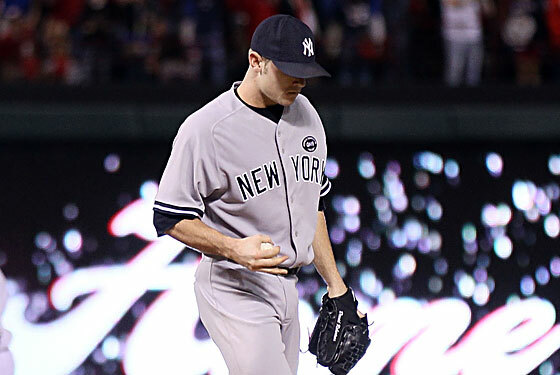 Sure, Phil Hughes was disappointing twice, and David Robertson was historically bad. (If you end up with an ERA of 20.25 in a series, it should be in one game, not four.) But the Yankees bats disappeared this series. Facing elimination, they only managed three hits off Colby Lewis, who is an underrated pitcher but not Cliff Lee. They were completely outhit and completely outpitched. When you look back at it, the surprise is not so much that the Yankees lost. The surprise is that they actually lasted six games. The Yankees lost this series because Texas, off to its first-ever World Series, was simply better. That's a hard thing to wrap one's mind around, but one has all winter to work on it.